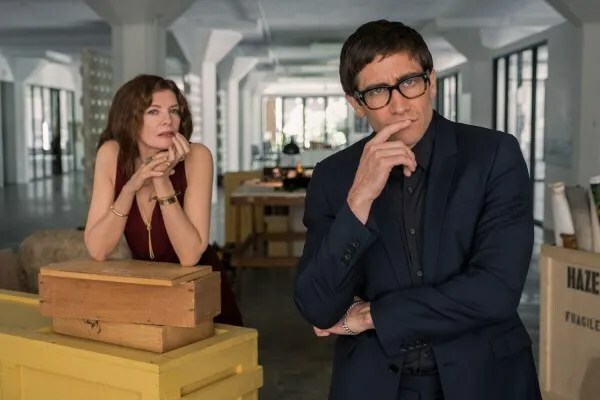 ‘Velvet Buzzsaw’: First Look Reveals Dan Gilroy’s Next Starring Jake Gyllenhaal and Rene Russo!!! Check It Out!! | Welcome to Moviz Ark! ‘Velvet Buzzsaw’: First Look Reveals Dan Gilroy’s Next Starring Jake Gyllenhaal and Rene Russo!!! Check It Out!! It’s a Nightcrawler reunion in the first image from the upcoming film Velvet Buzzsaw, which was just announced as part of the Premieres lineup at the 2019 Sundance Film Festival. Written and directed by Nightcrawler filmmaker Dan Gilroy, the film stars Jake Gyllenhaal and Rene Russo and is described as a thriller set in the contemporary art world scene of Los Angeles, “where big money artists and mega-collectors pay a high price when art collides with commerce.” The film was produced by Netflix and will debut on the streaming service at some point next year. This first-look image is mighty enticing, especially with regards to Gyllenhaal’s wholly unique look. I suppose you could say that’s right on point for the L.A. art scene, and I’m extremely curious to see just what in the world this movie is. Between this and Okja one thing’s for sure: When it comes to Netflix movies, Gyllenhaal has a look. After working as a screenwriter for a number of years, Gilroy burst onto the scene as a filmmaker in his own right with 2014’s spectacular Nightcrawler, which also boasts one of Gyllenhaal’s best performances ever. Gilroy’s follow-up film, 2017’s Roman J. Israel, Esq., suffered a bit of a sophomore slump however. The Denzel Washington-fronted drama was a bit rambling and unfocused when it came to the story, and I’m curious to see what lessons Gilroy learned—if any—that he applied to Velvet Buzzsaw. First reactions to the film will arrive in just a couple of short months, when it premieres at Sundance in January. Collider will be on the ground at the prestigious festival so you can look forward to our review at that time. For now, check out the image in its full glory below. The film also stars Toni Collette, Zawe Ashton, Tom Sturridge, and Natalia Dyer. The 2019 Sundance Film Festival runs from January 24th to February 3rd. ← ‘Game of Thrones’ Reunion Special Confirmed, But It Won’t Air on HBO!! !